You can easily arrange and summarize complex data in a Pivot Table. Creation and Manipulation of pivot table is supported in Excel 2007 and later formats, and pivot table in an existing document can be preserved for Excel 2003 format. Pivot tables do not take data directly from the source data, but take from the pivot cache that memorizes a snapshot of the data. The IPivotCache interface caches the data that needs to be summarized. The data in worksheet is added to the pivot cache as follows. IPivotTable represents a single pivot table object created from the cache. It has properties that customizes the pivot table. The following code creates a blank pivot table. The pivot table should be populated with required fields. The IPivotField represents a single field in the pivot table, which includes row, column, and data field axes. The IPivotDataFields represents a collection of data fields in the pivot table. The data field is added with the required subtotal function using the PivotSubtotalTypes enumeration. To learn more about different subtotal types supported in pivot tables, refer to the PivotSubtotalTypes in API section. The following code explains how to configure a pivot field as a data field. The following code snippet illustrates how to create a pivot table with existing data in the worksheet using XlsIO. Create the pivot table using Excel GUI. Specify the named range to be the data source of the pivot table. Make sure that the “Refresh on Open” option of the pivot table is selected. Dynamically refresh the data in the named range. XlsIO supports 85 built-in styles of Excel 2007 used to create a table with rich formatting using the PivotBuiltInStyles property as follows. To learn more about various built-in styles supported, refer to the PivotBuiltInStyles enumeration in API section. When you update the pivot table data source, refresh the pivot table manually to load the new data source into it. Essential XlsIO supports this refreshing of pivot table data source through IsRefreshOnLoad property of PivotCacheImpl. Refer the following complete code snippets. //The operation in SaveAndView under Xamarin varies between Windows Phone, Android, and iOS platforms. Refer to xlsio/xamarin section for respective code samples. Essential XlsIO allows you to expand and collapse the PivotFieldItems or simply the pivot table rows using IsHiddenDetails of PivotItemOptions. The filtered data of a pivot table displays only the subset of data that meets the specified criteria. This can be achieved in XlsIO using the IPivotFilters interface. The page field filter or report filter can filter the pivot table based on the page field items. The following code snippet illustrates how to apply multiple filters to the page field items. The row and column field filters can filter the pivot table based on labels, values, and items of the fields. The following code example illustrates how to apply these filters to a pivot table. Excel provides various options through the PivotTableOptions dialog box to customize the appearance of the pivot table. XlsIO supports these pivot table options using the IPivotTableOptions interface to control various settings for the existing pivot table. To learn more about various pivot table options, refer to the IPivotTableOptions in API section. The following code illustrates how to access the PivotTableOptions object. To show or hide the pivot table field list pane, use the ShowFieldList property. The RowHeaderCaption and ColumnHeaderCaption properties allows to edit the respective pivot table headers. The header caption can be enabled or disabled using the DisplayFieldCaption property. XlsIO provides an equivalent API to perform grand totals with the properties as follows. You can also show or hide the Collapse button that appears in the fields of the pivot table, when more than one item exists in a field. The following code example illustrates how to do this. The filter buttons and field names in the pivot table can be shown or hidden, as in the following code. 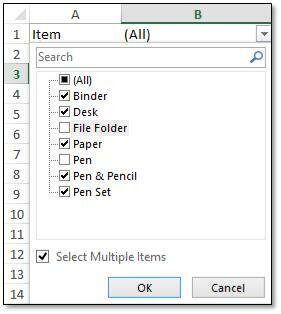 You can set the row label on each page while printing, and the header can be viewed on each page. You can repeat labels for row or column fields when the pivot table layout is set to tabular or outline layout forms. The following code illustrates how to set the repeat labels option to a specific pivot field. The following code illustrates how to set the repeat labels option to all the pivot fields. Top to Bottom sorting can sort the pivot table column field values based on the sort type. To apply Top to Bottom sorting in pivot table, you should apply the sorting in pivot row field by AutoSort method. The following code example illustrates how to apply Top to Bottom sorting to a pivot table. // Pivot Top to Bottom sorting.
' Pivot Top to Bottom sorting. Left to Right sorting can sort the pivot table row field values based on the sort type. To apply Left to Right sorting in pivot table, you should apply the sorting in pivot column field by AutoSort method. The following code example illustrates how to apply Left to Right sorting to a pivot table. // Pivot table Left to Right sorting.
' Pivot table Left to Right sorting. PivotCacheImpl.IsRefreshOnLoad property is set as true when applying AutoSort to pivot fields. Calculated field is a special type of database field that perform calculations by using the contents of other fields in the pivot table with the given formula. The formula can contain operators and expressions as in other worksheet formulas. You can use constants and refer to the data from the PivotTable. Formula cannot contain cell references or defined names. Formula cannot contain Worksheet functions that require cell references. Formula cannot use array functions. The calculated field in XlsIO can be achieved using the following code sample. The formula can also be set to the IPivotField property as follows. A pivot table can be created similar to the Excel layout. The following code example illustrates how to enable Essential XlsIO to layout the pivot table like Excel. //XlsIO supports pivot table layout in Windows Forms, WPF, ASP.NET, and ASP.NET MVC platforms.